Mcdonalds has a hot deal coming up! Get a hamburger for only $0.67! 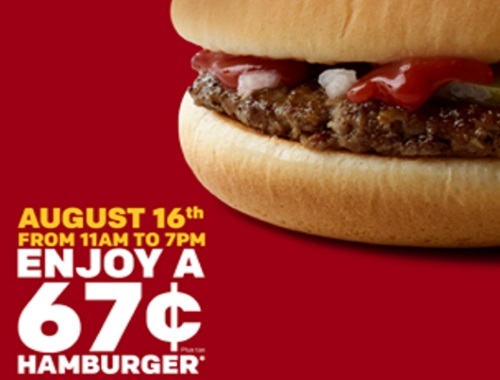 Mcdonalds is celebrating being in Canada since 1967 with hamburgers for only $0.67! This offer is valid August 16, 2017 11am-7pm! Taxes extra. Limit three hamburgers per customer per visit. Excludes McDelivery, any meals, pairings or other offers. While supplies last. At participating McDonald’s restaurants in Canada.